Less than a year after releasing Further, their best album in years, The Chemical Brothers are back with a brand-new album. Following in the footsteps of Daft Punk and Trent Reznor, the duo make their film score debut with the soundtrack to the upcoming thriller Hanna. Dark, edgy, and supremely engaging, this is a fantastic album in its own right. The album opens with "Hanna's Theme" and it sets the tone for the rest of the score. Music box sounds and dreamy vocalizations interplay with synths that suddenly take a very dark tone towards the end of the track. This combination of childlike sounds with harder, edgier ones suits a film about a teenage assassin. The Chemical Brothers use this motif in various ways throughout the album. One track that uses the motif quite well is "The Devil is in The Details." Imagine the theme song to the creepiest circus imaginable and you get this song. Nothing about the track is stereotypically foreboding. It just sounds like an experience where you go into an area and feel that something's not quite right. The effect is reversed somewhat when the creepy circus theme gets drums and funky sounds later on "The Devil is in The Beats." The Chemical Brothers are best-known for their ability to make music to move your feet. However, they excel just as well at creating quieter atmospheres. "The Sandman" has both music box elements and elements from "The Devil is in The Details" but is more than a retread. The use of organ towards the end of the track is both welcome and unexpected. "The Forest" is unlike any of the duo's typical studio work. It's an ambient piece with electronic whines and no real percussion. The "Lonesome Subway" portion of the three-piece "Interrogation / Lonesome Subway / Grimm's House" manipulates vocals into something that's both dreamlike and unsettling. Given that Hanna is an action film, there are also plenty of intense, fast-paced thrills in the score. The way "Bahnhof Rumble" shifts from few elements to many (and back again), you can tell it has to be music for someone evading bad guys. "Car Chase (Arp Worship)" is a wonderful piece that harkens back to early Chemical Brothers with its layers of synths, heavy bass, and pounding drums. "Hanna vs. Marissa" is another great track that wouldn't sound out of place on a studio album. The first 80 seconds of this song have the force of something much longer. If you've seen the trailer to Hanna, then you've heard pieces of the awesome "Escape Wavefold." This is a supremely cool track. Essentially, this song is just a mid-tempo beat. There's just something really appealing about its straightforwardness. The last major action track is "Container Park" and it's a doozy. It's not only the perfect backdrop for an action climax, it's also a song that could easily get a club moving. This track is begging for an extended remix. The Chemical Brothers hit it out of the park with their first film score. The Hanna soundtrack showcases everything great about this duo and proves that they still have new tricks up their sleeve. If this were a studio album, it would rank among the best of their career. The music is so good that you hope that the movie can live up to it. 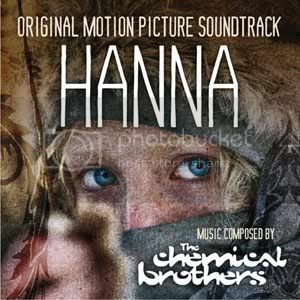 Hanna (Original Motion Picture Soundtrack) is available exclusively on iTunes.